Times Watchdog | Long before Electroimpact President Peter Zieve sent postcards to Mukilteo residents about a planned mosque, he was drawing strong reactions from some of his 800 employees with messages about “terrorist savages,” sterilization, procreation and more. Electroimpact engineer Jessica Loveridge asked the question, replying to a thread circulated last year on a company email group known as “jokes.” The thread wasn’t funny, as so many circulated among the group weren’t. It concerned terrorism and religion, a perennial topic among group members. Electroimpact founder and President Peter Zieve shared a link to a conservative blog carrying the rumor — never backed by evidence — that Andreas Lubitz, the pilot who committed suicide last year by crashing a Germanwings plane, killing everyone onboard, was a Muslim convert. Loveridge didn’t comment on anything in the thread. Instead, she noted that she had not opted into the jokes list, and didn’t want to be on it. “Time for you to leave EI,” Zieve replied, using shorthand for the company name, one that carries weight in the aerospace industry. 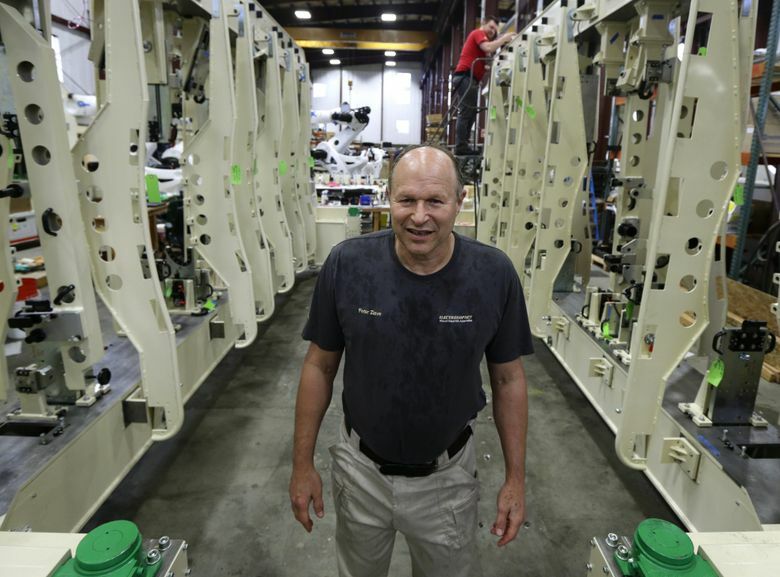 Mukilteo-based Electroimpact is a major supplier to Boeing and Airbus, hailed for its large, cutting-edge machines used to build planes and its unusual degree of worker autonomy. But interviews with six current and former employees, as well as numerous internal emails obtained by The Seattle Times, portray another side of the company culture, one shaped by Zieve’s forceful personality and controversial views. A hint of those views emerged publicly this month, when it became known that Zieve sent anonymous postcards to Mukilteo residents, informing them of plans to build a mosque in the city. The revelation prompted accusations of Islamophobia, including by his sister, Wendy Zieve. The group planning the mosque has since called for a boycott of Electroimpact. Yet the postcards, written in neutral language, were uncharacteristically subtle. Zieve has been bluntly sharing his views for a while with his roughly 800 employees, and losing some because of it. “I’m sure there are a lot of people who don’t like me, what can I say?” Zieve said, reached in Switzerland last week on vacation. He added that like his preferred presidential candidate, Donald Trump, he is not a “robot,” and said what he thought. Loveridge, who worked at Electroimpact’s U.K. division, was one who went elsewhere. She said her managers successfully fought for her job after Zieve’s “time for you to leave” email and a subsequent phone call, telling her she should go. But she felt unwelcome. Zieve said he didn’t remember the incident. But if it happened, he said, “I believe I would have cooled off and called immediately to apologize.” Loveridge said she recalls no apology. “Literally, hundreds of people emailed me to say, ‘thanks for saying that,’” Van Vranken recalled. By that time, Zieve had launched a “mosque watch group” of employees and local residents. Concerned about plans to build a mosque in Mukilteo, they met periodically on the company’s campus, according to employees and emails from Zieve publicizing the meetings. Another questioned the notion of free education. “So we do not want to waste the limited resources we have by trying to train people who will fail,” he wrote. A number of these types of threads arose from the regular announcements Zieve sent out announcing employee marriages or births. When employees marry or give birth, he shares the news with effusive emails. “It’s money that comes from my heart,” he added in the interview last week. He gave money to his employees as “gifts,” he said, money other business owners would use to buy houses and fancy cars. Shannon McCormack, a University of Washington law professor who writes about the tax burden on working parents, agrees on the expenses point, noting the huge cost of child care. “An employer attempting in some way to defray those costs is very interesting to me,” she said. “That is definitely a problem,” agreed state Human Rights Commission policy analyst Laura Lindstrand, although she allowed that she’d have to look into whether the bonuses really were a gift, which might be fine, or simply extra income. State law, she noted, does not prohibit job discrimination on the basis of family status. Nevertheless, she said, if a family-bonus policy is linked to a philosophy rooted in dislike of certain people, it could “open up a can of worms” that might call for looking at the company’s hiring practices. Of Electroimpact’s 629 U.S. employees, most of them mechanical and electrical engineers, 3 percent are women, according to company figures. Blacks, Asians and Hispanics together account for 6 percent. “It’s a real challenge to build a diverse workforce in aerospace and STEM fields,” said company chief of staff Ben Hempstead in an email. At UW’s College of Engineering, women made up 9 percent of students who last year earned undergraduate degrees in mechanical engineering. Asian Americans made up 25 percent of the class. Zieve wasn’t willing to talk at length about his views. He hung up twice during sequential interviews, and did not reply to a request for comment about specific workplace emails The Seattle Times had obtained. But before hanging up the second time, he said he regretted one thing related to the postcard about the planned mosque. “I don’t think there was anything wrong with it but it shouldn’t have been anonymous,” he said. For that, he said, he planned to apologize to Mohammed Riaz Khan, the head of the group intending to build the mosque. “The owner of the company has his personal opinions and those are separate from the mission of the company,” stressed Hempstead, who added that Zieve does not require employees to take actions based on his opinions. They could be distracting, though, said Brandon O’Toole, an engineer who started at the company in the summer of 2014. Every time an inflammatory email came from Zieve, he said, he got angry and found it difficult to focus on work.